Work. Love. Balance. Living What You Dream. When a feeding situation isn’t favorable, a mosquito can switch preferences, and it may learn to associate your scent with avoiding your incoming hand. If you keep swatting at a mosquito, will it leave you alone? Some scientists think so. But it depends. Some blood meals are worth a mosquito risking its life. But if there’s a more attractive or accepting alternative to feed from, a mosquito may move on to that someone or something instead. That’s because if you keep trying and missing, the mosquito may learn to associate your swatting vibrations with your scent, a study published Thursday in Current Biology suggests. And it just may remember: This is not a person who will tolerate me. Mosquitoes, which transmit diseases like Zika, Malaria and West Nile, do not just bite anything, said Jeffrey Riffell, a neuroecologist at The University of Washington who led the study. They prefer people over other animals, and some people over others. Attraction depends on how a person looks, smells or acts. But when a feeding situation isn’t favorable, a mosquito can switch preferences. To find out more about mosquito biting preferences, Dr. Riffell and his colleagues put mosquitoes and different odors into a vortex that creates vibrations similar to those created when a hand swats a forearm, but misses. In just 15 minutes, the mosquitoes learned to associate the odors with the vibrations. Some once attractive odors became threatening signals that the mosquitoes learned to avoid. Rather than approach them again, the mosquitoes chose to approach a new odor instead. For at least 24 hours, they retained this memory. Remembering the smell of a particularly defensive individual with a propensity to swat is important for a bug’s survival. One good smack to a mosquito stuck biting, and splat. Knowing who smells like a splat-maker means mosquitoes can seek out potentially less risky hosts instead. Dr. Riffell thinks learning about odors helps drives these decisions. 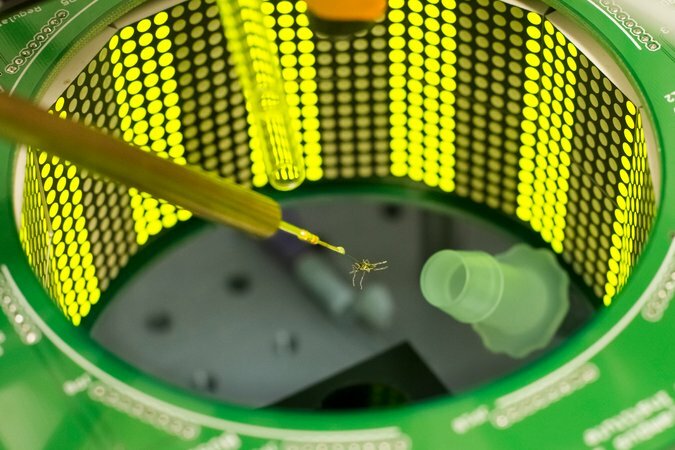 A mosquito being tested for its response to various odors. Mosquitoes can detect odor, temperature, sweat, even the presence of alcohol or pregnancy in a person. Mosquito senses are tuned for locating perfect hosts. From far away, carbon dioxide from our breath draws them in and triggers their visual system to seek out high contrast objects for inspection. Up close, mosquitoes detect odor, temperature, sweat and even the presence of alcohol or pregnancy(pregnant women emit more carbon dioxide). If signs of a good host don’t check out, the mosquito doesn’t bite. But just how the insect processes the more than 200 chemicals in a person’s scent signature isn’t fully understood. One thing that helps, the researchers determined, is dopamine, a chemical in the brain that contributes to learning in humans, honeybees and other animals. Dr. Riffell thinks dopamine works by helping mosquitoes pick out an individual’s scent signature from other odors. 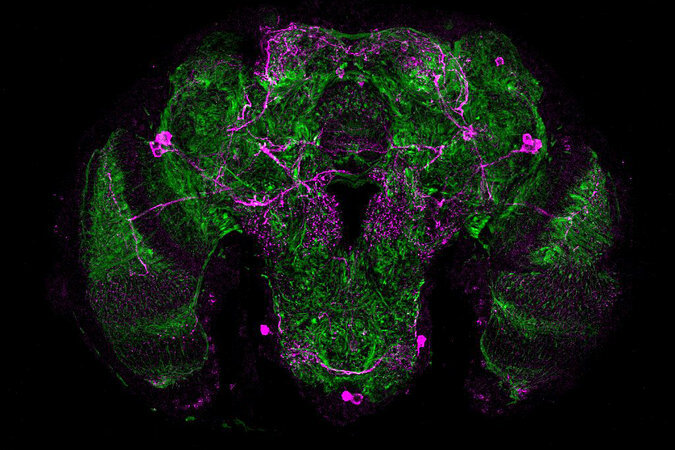 Dopamine staining in the brain of the Aedes aegypti mosquito. Scientists believe dopamine might help mosquitoes process a person’s scent signature from other odors. Dopamine travels through the brain and binds to receptors like a key in a lock, opening doors and creating connections between nerve cells that can drive behavior or thinking. When the researchers edited mosquito genes to remove these dopamine receptors, the insects lost their ability to learn. They also lost activity in the area of their brain associated with olfaction. Understanding more about how mosquitoes process information and select hosts can help people develop more targeted ways to control disease transmission, like combining traps or lures with bed nets and insecticides. Another possibility once more is known, said Dr. Riffell, would be to target dopamine and impair learning in mosquitoes with insecticides or genetic tools. While a dopamine-impaired mosquito may not recognize your scent, it also may not realize swatting is avoidable. Follow Our Journey On Instagram ! Town Life Magazine is all about you and me and our neighbours. It follows the lives and events in your community, and we want to bring it to you all in one place. © All Right Reserved. Another Yaama Media Project.